In real estate – referrals are the name of the game. Sometimes, however, determining the best way to market to your personal sphere can be challenging. 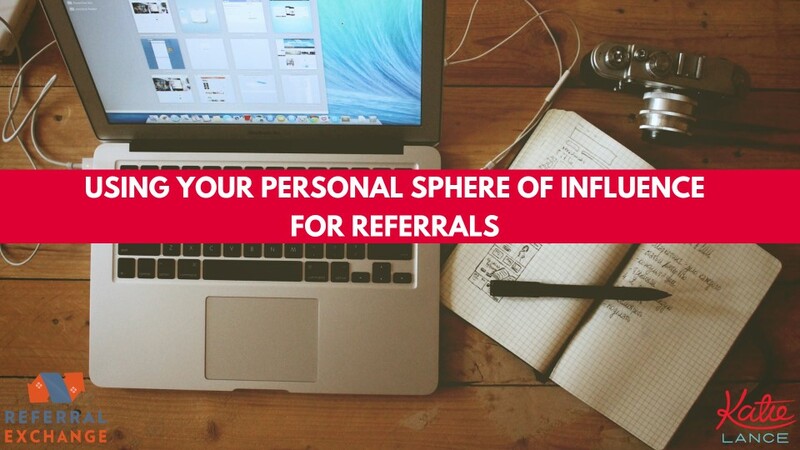 Our VP of Marketing Lisa Fettner recently hosted a webinar with social media strategist and author, Katie Lance to discuss tips, tools and strategies for how to effectively leverage your personal sphere of influence to increase your referral business. Here are some key takeaways from the webinar. Do’s and Don’ts of working with your sphere. DO: be helpful, thoughtful, and treat your sphere how you would like to be treated. DON’T: send canned marketing, be a spammer, or be a nuisance. Use social media – post about a property on your old street or let your former colleagues know you’re an agent now. Holiday messages – send holiday messages from your work email with your business signature and information. Sponsor events – consider sponsoring friend/family events or activities (e.g., baseball game, charity run). Network – use family events and community activities to let your sphere of influence know you can be their real estate resource. Ask them what their real estate goals are for 2019. Lead a project that requires engagement from others (e.g., a family tree, have family members share their holiday decorations). Be the GO-TO real estate advisor for you sphere. Offer a 5-minute favor such as recommending a good landscaper or pulling some market data about their area. Be the hero of your sphere – have a network in place to help anyone, anywhere. We live in a global, extended market place – consumers expect you to give them information no matter where they live. You don’t always have to say yes. Although you may want to work every referral that comes your way, it may not always make sense to. Lisa emphasizes that it’s critical to be consistent with who you do and don’t work with – doing so will save on “hurt feelings” or confusion in the future. Below are some scripts Lisa shared to help you navigate the situation. I’d be happy to tour/look at/do an analysis of your property at any time. We can either work together, or I can find you someone who would be a perfect fit. I’d love to help you, but I’m not an expert in your area/price point/property type. I’m a member of a network that works with agents who specialize in [xyz] and can help find the best fit for you. I actually make it a policy not to work directly with friends or family members, but I’m part of a nationwide network of top agents, and I can find the perfect one for you. The power of staying in touch with your sphere. Staying in touch with your network could be the difference between them calling you or someone else when they have a real estate need or question. Stay top-of-mind by choosing your social channels based on what your clients and future clients are using. Katie emphasized the importance of creating content that attracts who you want to work with (e.g., video, Facebook Live). You only have so many hours in a day, so focusing on quality over quantity is key – remember, you don’t have to be all things to all people. Use LinkedIn and Facebook to stay in touch with your sphere. Lisa shared a few easy tips on how to make the most of LinkedIn: update your bio, let people know that you’re in real estate, publish and share new content and reach out to 5-10 people in your sphere once a month on the platform. On Facebook, Katie suggests creating different lists to organize your sphere and interactions (e.g., friend/connect with them, interact with them, add them to your “see first” notifications). Use Facebook messenger to start a private conversation or use the FB voice feature to send them a personal message. If you’re creating one piece of content, make sure you distribute it in multiple ways, on multiple channels (e.g., videos, social media posts, blogs, newsletters). Are you making the most out of your personal sphere of influence? Watch the full webinar recording here.